Television and radio personality Wink Martindale remembers the day nearly 60 years ago when Elvis Presley’s first single, “That’s All Right,” played for the first time on the radio. It was July 8, 1954, and a fresh-faced Martindale was working as a disc jockey at WHBQ in Memphis. He was at the studio when legendary producer Sam Phillips brought by an acetate copy of the song Presley cut at Phillips’ Sun Records. DJ Dewey Phillips – no relation to Sam – played the song on his influential “Red, Hot and Blue” radio show, and rock n’ roll history was made. Martindale and Jenna Bush Hager, daughter of former President George W. Bush, attended the annual birthday party at Presley’s longtime Memphis home. The event featured a cake cutting and the singing of “Happy Birthday” by 16-year-old Canadian David Thibault (TEE’-bo). Bush Hager, a correspondent for the “Today” show, was at Graceland to tour the home and tape a segment with Thibault. The teen from Quebec has gained fame after his singing of “Blue Christmas” garnered millions of views on YouTube. Bush Hager, Thibault, and Martindale participated in the cake-cutting along with producer Knox Phillips, who is Sam Phillips’ son and a member of the Memphis Music Hall of Fame. Martindale was a longtime friend of Presley, who dated Martindale’s wife Sandy before they married. After his days in Memphis, Martindale went on to TV fame as host of Teenage Dance Party and the game shows Gambit and Tic Tac Dough. 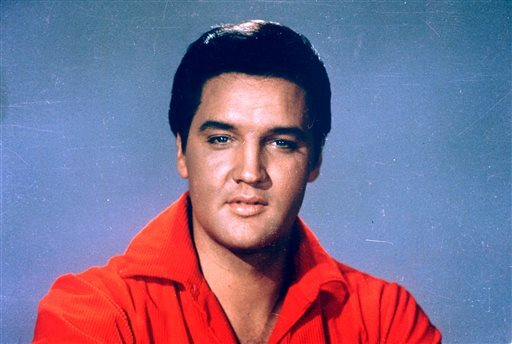 Presley was born in Tupelo, Miss., on Jan. 8, 1935, and moved to Memphis with his parents at age 13. He was 42 when he died Aug. 16, 1977.